Today, we're happy to announce the developer preview of TensorFlow Lite, TensorFlow’s lightweight solution for mobile and embedded devices! TensorFlow has always run on many platforms, from racks of servers to tiny IoT devices, but as the adoption of machine learning models has grown exponentially over the last few years, so has the need to deploy them on mobile and embedded devices. TensorFlow Lite enables low-latency inference of on-device machine learning models. More and more mobile devices today incorporate purpose-built custom hardware to process ML workloads more efficiently. 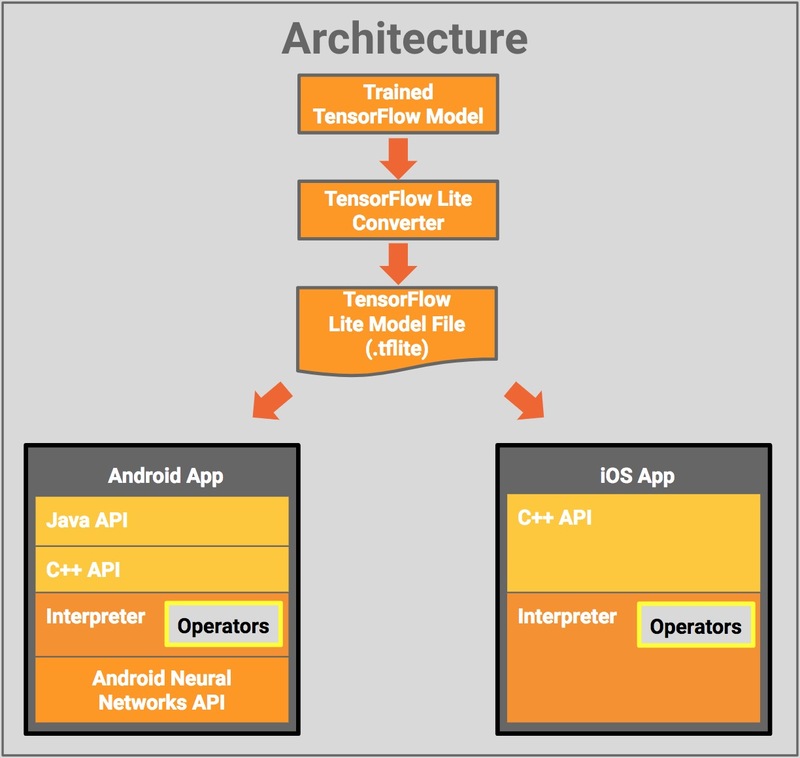 TensorFlow Lite supports the Android Neural Networks API to take advantage of these new accelerators as they come available. TensorFlow Lite falls back to optimized CPU execution when accelerator hardware is not available, which ensures your models can still run fast on a large set of devices. TensorFlow Model: A trained TensorFlow model saved on disk. TensorFlow Lite Converter: A program that converts the model to the TensorFlow Lite file format. TensorFlow Lite Model File: A model file format based on FlatBuffers, that has been optimized for maximum speed and minimum size. Interpreter: Executes the model using a set of operators. The interpreter supports selective operator loading; without operators it is only 70KB, and 300KB with all the operators loaded. This is a significant reduction from the 1.5M required by TensorFlow Mobile (with a normal set of operators). On select Android devices, the Interpreter will use the Android Neural Networks API for hardware acceleration, or default to CPU execution if none are available. Developers can also implement custom kernels using the C++ API, that can be used by the Interpreter. Smart Reply: An on-device conversational model that provides one-touch replies to incoming conversational chat messages. First-party and third-party messaging apps use this feature on Android Wear. Inception v3 and MobileNets have been trained on the ImageNet dataset. You can easily retrain these on your own image datasets through transfer learning. As you may know, TensorFlow already supports mobile and embedded deployment of models through the TensorFlow Mobile API. Going forward, TensorFlow Lite should be seen as the evolution of TensorFlow Mobile, and as it matures it will become the recommended solution for deploying models on mobile and embedded devices. With this announcement, TensorFlow Lite is made available as a developer preview, and TensorFlow Mobile is still there to support production apps. The scope of TensorFlow Lite is large and still under active development. With this developer preview, we have intentionally started with a constrained platform to ensure performance on some of the most important common models. We plan to prioritize future functional expansion based on the needs of our users. The goals for our continued development are to simplify the developer experience, and enable model deployment for a range of mobile and embedded devices. We are excited that developers are getting their hands on TensorFlow Lite. We plan to support and address our external community with the same intensity as the rest of the TensorFlow project. We can't wait to see what you can do with TensorFlow Lite. For more information, check out the TensorFlow Lite documentation pages. Thank you! re: "solution for mobile and embedded devices", can we expect to see early support for rpi & piZero-w? The process for getting TF on a piZero right now is pretty painful. Many of us who are using TF on rpis for research in the self driving car space would *really* make good use of TF on a pi zero-w due to the cost difference and wifi support . Thank you! How about the inference speed compared to other mobile DL framework such as https://github.com/Tencent/ncnn ? 1. Is it possible to retrain the model using Tensorflow Lite direct on the Android device? 2. Are you planning to support Tensorflow Lite on Raspberry Pi 3? 1. It is not yet possible to do training with TensorFlow lite on-device. That is an obvious avenue of future work that we are excited about. 2. It should be pretty easy to build TensorFlow Lite on Raspberry PI. We plan to make sure this path works seamlessly soon, but for the initial release we have tested tflite on Android and iOS. For TF-integrated solutions that run on mobile and desktop platforms, would you recommend migrating to TensorFlow Lite across all platforms, or is there a benefit to using TensorFlow Lite on mobile and "regular" TensorFlow on desktop? Can anyone please show an example of how to use this API on Android?